Some 42 years ago, renowned theoretical physicist Stephen Hawking proposed that not everything that comes in contact with a black hole succumbs to its unfathomable nothingness. Tiny particles of light (photons) are sometimes ejected back out, robbing the black hole of an infinitesimal amount of energy, and this gradual loss of mass over time means every black hole eventually evaporates out of existence. Known as Hawking radiation, these escaping particles help us make sense of one of the greatest enigmas in the known Universe, but after more than four decades, no one’s been able to actually prove they exist, and Hawking’s proposal remained firmly in hypothesis territory. But all that could be about to change, with two independent groups of researchers reporting that they’ve found evidence to back up Hawking’s claims, and it could see one of the greatest living physicists finally win a Nobel Prize. So let’s go back to 1974, when all of this began. Hawking had gotten into an argument with Princeton University graduate student, Jacob Bekenstein, who suggested in his PhD thesis that a black hole’s entropy – the ‘disorder’ of a system, related to its volume, energy, pressure, and temperature – was proportional to the area of its event horizon. As Dennis Overbye explains for The New York Times, this was a problem, because according to the accepted understanding of physical laws at the time – including Hawking’s own work – the entropy and the volume of a black hole could never decrease. Hawking investigated the claims, and soon enough, realised that he had been proven wrong. “[D]r Hawking did a prodigious calculation including quantum theory, the strange rules that govern the subatomic world, and was shocked to find particles coming away from the black hole, indicating that it was not so black after all,” Overbye writes. Hawking proposed that the Universe is filled with ‘virtual particles’ that, according to what we know about how quantum mechanics works, blink in and out of existence and annihilate each other as soon as they come in contact – except if they happen to appear on either side of a black hole’s event horizon. Basically, one particle gets swallowed up by the black hole, and the other radiates away into space. “No result in theoretical physics has been more fundamental or influential than his discovery that black holes have entropy proportional to their surface area,” says Lee Smolin, a theoretical physicist from the Perimeter Institute for Theoretical Physics in Canada. While Bekenstein received the Wolf Prize in 2012 and the American Physical Society’s Einstein prize in 2015 for his work, which The New York Timessays are often precursors to the Nobel Prize, neither scientist has been awarded the most prestigious prize in science for the discovery. Bekenstein passed away last year, but Hawking is now closer than ever to seeing his hypothesis proven. The problem? Remember when I said the escaping photons were stealing an infinitesimal amount of energy from a black hole every time they escaped? Well, unfortunately for Hawking, this radiation is so delicate, it’s practically impossible to detect it from thousands of light-years away. But physicist Jeff Steinhauer from Technion University in Haifa, Israel, thinks he’s come up with a solution – if we can’t detect Hawking radiation in actual black holes thousands of light-years away from our best instruments, why not bring the black holes to our best instruments? As Oliver Moody reports for The Times, Steinhauer has managed to created a lab-sized ‘black hole’ made from sound, and when he kicked it into gear, he witnessed particles steal energy from its fringes. Reporting his experiment in a paper posted to the physics pre-press website, arXiv.org, Steinhauer says he cooled helium to just above absolute zero, then churned it up so fast, it formed a ‘barrier’ through which sound should not be able to pass. “Steinhauer said he had found signs that phonons, the very small packets of energy that make up sound waves, were leaking out of his sonic black hole just as Hawking’s equations predict they should,” Moody reports. To be clear, the results of this experiment have not yet been peer-reviewed – that’s the point of putting everything up for the public to see on arXiv.org. They’re now being mulled over by physicists around the world, and they’re already proving controversial, but worthy of further investigation. Meanwhile, a paper published in Physical Review Letters last month has found another way to strengthen the case for Hawking radiation. Physicists Chris Adami and Kamil Bradler from the University of Ottawa describe a new technique that allows them to follow a black hole’s life over time. That’s exciting stuff, because it means that whatever information or matter that passes over the event horizon doesn’t ‘disappear’ but is slowly leaking back out during the later stages of the black hole’s evaporation. Both results will now need to be confirmed, but they suggest that we’re inching closer to figuring out a solution for how we can confirm or disprove the existence of Hawking radiation, and that’s good news for its namesake. As Moody points out, Peter Higgs, who predicted the existence of the Higgs boson, had to wait 49 years for his Nobel prize, we’ll have to wait and see if Hawking ends up with his own. Haifa-based scientist Jeff Steinhauer has simulated a black hole in his laboratory, and it might be the breakthrough that helps celebrated physicist Stephen Hawking win the Nobel Prize. CNN’s Ian lee reports. Take that, reviewer number 2. As a scientist, there are few things more soul-crushing than spending months or years working on a paper, only to have it rejected by your journal of choice – especially when you really feel like you’re onto something important. But it turns out that plenty of world-famous researchers went through rejection before finally having their papers published – including a few papers that later went on to win a Nobel Prize. That’s not to say the publication system failed these researchers – in fact, the rejection process is part of good, healthy peer-review. Peer-review involves having a group of independent researchers read every paper submitted to a journal to make sure that the methods and conclusions are solid. They will often suggest revisions to be made, and can reject a paper if they think more work needs to be done, or if it’s not the right fit for the journal. Following rejection, the end product is usually better than it would have been originally – or it at least, ends up in a more approporiate journal. Hearing about the renowned pieces of work that faced setbacks before going on to revolutionise the field is a comforting reminder that rejection isn’t necessarily the end of your research – sometimes it’s just the beginning. Weak interaction, one of the four (or potentially five) fundamental forces of nature, was first described by Enrico Fermi back in 1933, in his paper “An attempt of a theory of beta radiation,” published in German journal Zeitschrift für Physik. But it was first rejected from Nature for being ‘too removed from reality’. The paper went on to be the foundation of the work that won Fermi the 1938 Nobel Prize in Physics, at the age of 37, for “demonstrations of the existence of new radioactive elements produced by neutron irradiation, and for his related discovery of nuclear reactions brought about by slow neutrons”. Yes, even scientists who have textbook processes named after them have faced rejection. 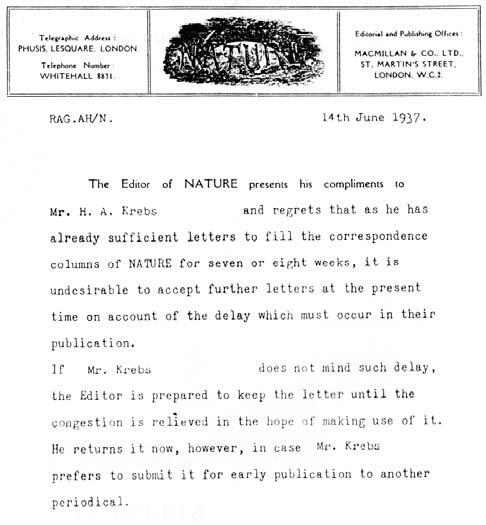 There wasn’t anything wrong with Krebs’ paper, but Nature had such a backlog of submissions at the time that they simply couldn’t look at it. “This was the first time in my career, after having published more than 50 papers, that I had rejection or semi-rejection,” Krebs wrote in his memoir. The paper, “The role of citric acid in intermediate metabolism in animal tissues,” went on to be published in the Dutch journal Enzymologia later that year, and in 1953 Krebs won the Nobel Prize in Medicine for “his discovery of the citric acid cycle”. “That was not my title, which was: ‘Isotopic Spin and Curious Particles.’ Physical Review rejected ‘Curious Particles’. I tried ‘Strange Particles’, and they rejected that too. They insisted on: ‘New Unstable Particles’. That was the only phrase sufficiently pompous for the editors of the Physical Review. Sometimes it’s not the content of a journal article that has it rejected, but the headline. In the end it didn’t really matter what the headline was, seeing as Gell-Mann was awarded the 1969 Nobel Prize in Physics “for his contributions and discoveries concerning the classification of elementary particles and their interactions”. 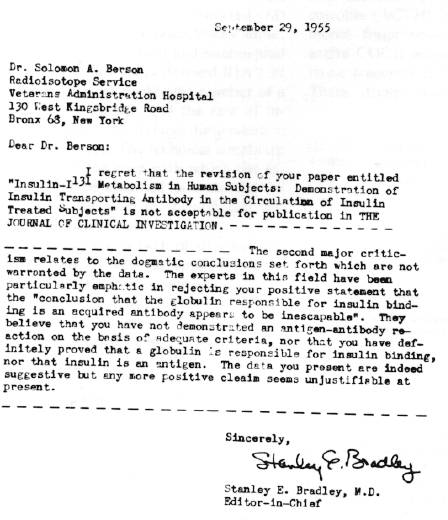 Years after winning the Nobel Prize in Physiology and Medicine in 1977, Rosalyn Yalow would show this rejection letter around proudly. It was sent by The Journal of Clinical Investigation because the reviewers were skeptical that humans could make antibodies small enough to bind to things like insulin. She proved them wrong, and now radioimmunoassay is a common technique used for determining antibody levels in the body – it works by releasing an antigen tagged with a radioisotope and tracking it around the body. This one took a while to earn recognition, but after having his seminal paper on the Higgs model rejected back in 1966, Higgs was finally awarded the Nobel Prize in Physics in 2013, after researchers at CERN detected evidence of the Higgs boson at their ATLAS and CMS experiments. His original paper, “Spontaneous symmetry breakdown without massless bosons,” was published in Physical Review later that year. You might not have heard much about NMR spectroscopy, but it’s responsible for revealing details about the structure and dynamics of molecules – something that’s incredibly handy for chemists and biochemists. But the first paper outlining the technology, “Application of Fourier Transform Spectroscopy to Magnetic Resonance,” received little attention at the time. Richard Ernst received the Nobel Prize in Chemistry in 1991. Quasicrystals are structures that are ordered but not periodic, but when Dan Shectman first reported on these strange structures back in his 1984 paper “The Microstructure of Rapidly Solidified Al6Mn,” it was rejected by Physical Review Letters for being more relevant to metallurgic researchers. It was published by Metallurgic Transactions A later that year, and Shechtman went on to win the Nobel Prize in 2011. Kary Mullis was jointly awarded the 1993 Nobel Prize in Chemistry for “his invention of the polymerase chain reaction (PCR) method”. PCR is the technique that is used every day in labs across the world to amplify DNA strands – but the first paper describing it was rejected by Science. No word as yet on why, but we bet the journal was pretty sore to miss out on that scoop. If you want more healthy reminding of the long list of no’s behind success, check out the CV of failures a Princeton professor wrote earlier this year. I don’t know about you, but I feel so much better now. It’s speculation season once again for Nobel Prize watchers. Monday morning winners of the prestigious Lasker Awards for three areas of research in medicine and biology were named, and the so-called “American Nobels” often presage their European counterpart. Eighty-six Lasker laureates have gone on to receive a Nobel Prize, including 47 in the last three decades, according to the Lasker Foundation. This year Kazutoshi Mori and Peter Walterwill receive a Lasker for discovering how the body fixes misshapen proteins—which would otherwise cause damage or disease—in a part of the cell called the endoplasmic reticulum. Another Lasker will go to Alim Louis Benabid of Joseph Fourier University in Grenoble, France, and Mahlon DeLong, the researchers behind deep-brain stimulation, a surgical technique to alleviate certain symptoms of Parkinson’s disease.Mary-Claire King will also receive a Lasker for her work contributing both to medical science and human rights. She uncovered the gene location and significance of theBRCA1 gene, which increases risk of hereditary breast cancer. She also developed techniques that use DNA to help reunite missing persons and their families. Walter, one of this year’s winners, spoke with Scientific American about the import of his discoveries and his sheer love for basic research. Roughly one third of all proteins are modified, folded and assembled in the endoplasmic reticulum. What are the consequences if something goes wrong there? The endoplasmic reticulum is the weigh station the protein goes through on the way to become either secreted from the cell or be embedded in the plasma membrane. Unfolded proteins create stress on the cell, and you potentially create situations where you now put less assembled proteins in the plasma membrane. Not only do you compromise the integrity of the membrane, but you also put in machinery that may no longer function properly. You now have cells that may inappropriately signal and become rogue cells that could become a danger to the organism. Rather than doing that, the cells try to establish equilibrium and then establish a balance between capacity and need. If that balance cannot be achieved, the cell submits to apoptosis—cell death. With retinitis pigmentosa, for example, it’s an inherited protein misfolding disease. Proteins don’t fold properly; the whole cell gets frustrated by having misfolded proteins, so the cell kills itself. What keeps unfolded proteins from overwhelming the system? There are various machineries in the cell called molecular chaperones that protect proteins from undergoing premature interactions and bind to unfolded proteins and keep them soluble until they can properly mature. We are standing on the shoulders of giants—work that helped identify the role of the chaperones led to the Lasker Award a few years ago, and those researchers, too, stood on the shoulders of others. When you first embarked on this area of research in 1993, what were you hoping to find? We wanted to find the molecular machinery that allows one component of the cell to talk to another. There was virtually nothing known about what was taking place. We used yeast—a system easily accessible genetically—and asked the question how does one part of the cell know what is going on in another part. That led us into the mode of discovery. It was a very, very simple question—and at the beginning we had simple answers. The deeper we dove, however, the more complex it became and the more beautiful it became. The single-cell organism findings applied directly to human physiology, with pretty much everything we learned from yeast applying to humans as well. What did you find in these cells? We discovered machinery by which the cell has the capacity to fold the protein properly and pathway by which this happened. We mapped the components of the pathway and everything turned out to be more exciting than we could have hoped for. It was basically pure curiosity. We had no preconceived notions that it would turn out to be anything as exciting as it was in the end. How were you able to map out what was happening? We had engineered yeast cells and put an enzyme into the cells that produces a color reaction. So, normally when proteins folded in the cell they turned blue but mutant cells didn’t allow that signal to arrive and they didn’t change color. That allowed us to map the pathway and understand it. What questions still need to be answered in this arena? There are many, many questions at every level. At the mechanistic level we try to understand the machinery as enzymes and little molecular machines, trying to see how we can manipulate them the best and push them a little bit one way or another. At another level we have multiple branches at the signaling level and we need to understand how they interact with one another. At a clinical level we need to understand where we can interfere or intervene with the signaling pathway to the benefit of the patient. What is your research focusing on now? We are trying to figure out the molecular pathways by which the cells make the decisions and decide if they need to kill themselves. We’re also mapping some of the components on that decision pathway and trying to figure out how to influence them one way or another and put them in disease models so we can see how we can effect a benefit. We are working on how to screen for and isolate small molecules to impact that pathway and test them in animal models for a number of different diseases. What significance will the Lasker Award have for that research? I think it’s very thrilling for us. I’m particularly proud that we started from the basic research interest and it’s now developed into clinical relevance. We only got here because of sheer curiosity and the generous funding we got for this foundational research. At the beginning it wasn’t clear where the benefit would be and we didn’t propose at the beginning any translational applications. They only developed after we understood what was going on. The emphasis on basic curiosity in clinical research is so important to drive our knowledge forward. This award will help with that in an enormous way—the publicity that comes with this and the focus on it for human health. What is the greatest challenge currently facing researchers in basic biology and basic research? I think that right now there is a climate in research funding where you have to justify translational applications at the onset. Curiosity isn’t enough to justify that something is worth pursuing now and I think to some degree it’s not always the most effective way of moving forward. What do you tell your students interested in basic research working in the current climate? My advice is to be patient and that the pendulum swings back. You need to educate the public about the importance of your work and to just really justify the value of what you are doing. I think science education is incredibly important and the general public needs to understand that these discoveries are essential. Do you see therapeutic applications arising from your initial breakthrough in the foreseeable future? I certainly hope so. We have very active collaborations with biotechnology companies to develop components that will affect these pathways. They are putting them through all the tests for cancer and other diseases. I hope one of them will develop into a tangible drug. It’s a very different approach for cancer, for example, because what we are looking at here are pathways for every cell. 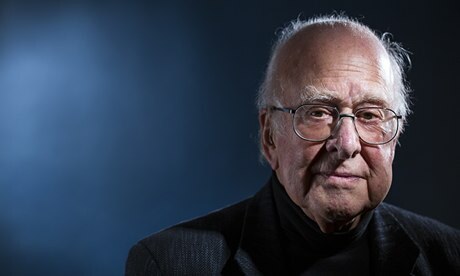 Peter Higgs: I wouldn’t be productive enough for today’s academic system. He regrets that the particle he identified in 1964 became known as the “God particle”. He has never been tempted to buy a television, but was persuaded to watch The Big Bang Theory last year, and said he wasn’t impressed. Are You A Right Brain Or Left Brain Thinking ? Have you ever heard people say that they tend to be more of a right-brain or left-brain thinker? From books to television programs, you’ve probably heard the phrase mentioned numerous times or perhaps you’ve even taken an online test to determine which type best describes you. Given the popularity of the idea of “right brained” and “left brained” thinkers, it might surprise you learn learn that this idea is little more than a myth. What Is Left Brain – Right Brain Theory? According to the theory of left-brain or right-brain dominance, each side of the brain controls different types of thinking. Additionally, people are said to prefer one type of thinking over the other. For example, a person who is “left-brained” is often said to be more logical, analytical, and objective, while a person who is “right-brained” is said to be more intuitive, thoughtful, and subjective. In psychology, the theory is based on what is known as the lateralization of brain function. So does one side of the brain really control specific functions? Are people either left-brained or right-brained? Like many popular psychology myths, this one grew out of observations about the human brain that were then dramatically distorted and exaggerated. The right brain-left brain theory originated in the work of Roger W. Sperry, who was awarded the Nobel Prize in 1981. While studying the effects of epilepsy, Sperry discovered that cutting the corpus collosum (the structure that connects the two hemispheres of the brain) could reduce or eliminate seizures. However, these patients also experienced other symptoms after the communication pathway between the two sides of the brain was cut. For example, many split-brain patients found themselves unable to name objects that were processed by the right side of the brain, but were able to name objects that were processed by the left-side of the brain. Based on this information, Sperry suggested that language was controlled by the left-side of the brain. Later research has shown that the brain is not nearly as dichotomous as once thought. For example, recent research has shown that abilities in subjects such as math are actually strongest when both halves of the brain work together. Today, neuroscientists know that the two sides of the brain work together to perform a wide variety of tasks and that the two hemispheres communicate through the corpus collosum. While the idea of right brain / left brain thinkers has been debunked, its popularity persists. So what exactly does this theory suggest? While often over-generalized and overstated by popular psychology and self-help texts, understanding your strengths and weaknesses in certain areas can help you develop better ways to learn and study. For example, students who have a difficult time following verbal instructions (often cited as a right-brain characteristic) can benefit from writing down directions and developing better organizational skills. Researchers discover new form of 12-sided quasicrystal. A team of researchers working at Germany‘s Martin-Luther-Universität has discovered a new form of a 12-sidded quasicrystal. In their paper published in the journal Nature, the team describes how they accidently created the previously unknown crystalline structured material while investigating interfacing properties between various substances. Quasicrystals are substances that look a lot like crystals but have one major exception—the pattern of their structure is non-repeating. They were first discovered in 1982 by Daniel Shechtman—he won the Nobel Prize in chemistry for it in 2011. Since that time they have been created in the lab in various ways and have even been found in nature—as part of a meteorite that fell in Russia (which because it was found to have been created by a non-heat related astrophysical process, showed that applying heat wasn’t necessary to create them). In this latest effort the researchers created one using perovskite oxides, potentially extending the number of materials that can be created by such substances. The team in Germany was investigating the ways perovskite behaved when used as a layer on top of a metal base. After exposure to extremely high temperatures, they noted that the material began to shape into a pattern, which they naturally assumed was a crystal. Upon closer inspection, they found that the 12-sided pattern didn’t repeat itself—the mark of a quasicrystal. The team notes that perovskite oxides are not normally noted for forming into quasicrystals, and in fact, no one really thought it was possible. The discovery extends the types of quasicrystals that are known to exist, though not all of them have 12 sides of course. Their unusual structures make possible the creation of materials with unusual properties which scientists are just now beginning to find. Finding ways to create them using materials not normally associated with such odd structures may pave the way to a much broader array of end products—now that scientists know that it is possible, the door has been opened to creating all sorts of new materials from perovskite oxide based quasicrystals (now called barium titanate), such as thermal insulators or coatings for electronic components. The discovery of quasicrystals—crystalline structures that show order while lacking periodicity—forced a paradigm shift in crystallography. Initially limited to intermetallic systems, the observation of quasicrystalline structures has recently expanded to include ‘soft’ quasicrystals in the fields of colloidal and supermolecular chemistry. Here we report an aperiodic oxide that grows as a two-dimensional quasicrystal on a periodic single-element substrate. On a Pt(111) substrate with 3-fold symmetry, the perovskite barium titanate BaTiO3 forms a high-temperature interface-driven structure with 12-fold symmetry. The building blocks of this dodecagonal structure assemble with the theoretically predicted Stampfli–Gähler tiling having a fundamental length-scale of 0.69?nm. This example of interface-driven formation of ultrathin quasicrystals from a typical periodic perovskite oxide potentially extends the quasicrystal concept to a broader range of materials. In addition, it demonstrates that frustration at the interface between two periodic materials can drive a thin film into an aperiodic quasicrystalline phase, as proposed previously. Such structures might also find use as ultrathin buffer layers for the accommodation of large lattice mismatches in conventional epitaxy. The 2013 Nobel Prize in Physiology or Medicine.